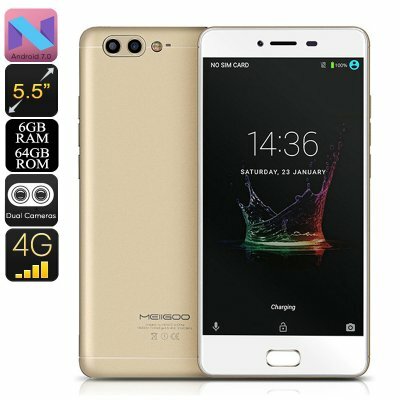 Successfully Added Meiigoo M1 Android Phone - Android 7.0, Octa-Core CPU, 6GB RAM, 5.5 Inch FHD, 4000mAh, 16MP Dual-Rear Camera, 4G (Gold) to your Shopping Cart. If you love to snap pictures with your smartphone, the Meiigoo M1 Android phone is perfect for you. This stunning Chinese smartphone comes packed with a 16MP Dual-Rear camera. This snapper lets you shoot absolutely stunning pictures and Full-HD video. Additionally, the phone features a 13MP front camera which is perfect for taking selfies with your friends. With this Android phone at your side, you’ll have all the means necessary to shoot stunning pictures at all times. Whether it’s a birthday, holiday, or simply a day out in the park – with the Meiigoo M1 nothing stays uncaptured. The MediaTek6757 processor that this cell phone holds lets you enjoy a powerful performance. Clocked at 1.6GHz, this Octa-Core CPU lets you tackle demanding Apps without dropping a frame. Your phone also packs a whopping 6GB of RAM that will further increase your overall user experience. No matter what you throw at it, this Android phone will take it like a champ. Thanks to its 4000mAh battery, you’ll be able to enjoy all it has to offer throughout the day. Android 7.0 will treat you to a smooth experience while using your favorite Apps. On the phone’s 5.5-Inch display, you can enjoy stunning Full-HD visuals in 1080p resolution. By treating you to sharp details and vivid color, this Android phone is sure to enhance your mobile media experience. The phone comes with 64GB internal storage and a 128GB SD card slot that are ready to be filled up with the films, games, and Applications of your liking. With Dual-IMEI numbers and 4G support, you’ll always be able to download or stream media online.